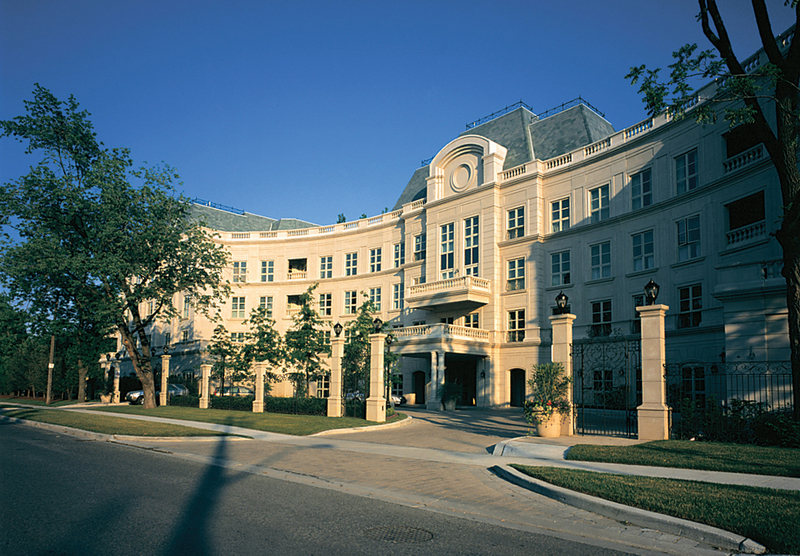 This four storey up scale condominium, designed to resemble a palatial French chateau, is located at the south-east corner of Bayview Avenue and Post Road, in Toronto. It is founded on strip footings, and spread footings, bearing on natural undisturbed soil with a safe bearing capacity of 500 kilopascals, (ie. 10,440 pounds or 5.22 tons per square foot). Since each residential unit, above the ground floor, is accessed by an elevator, opening directly into the suite, there are five elevator shafts with two elevators in each shaft and five sets of scissor stairs. For the most part, the ground floor slab is a 600 mm thick reinforced concrete flat plate with 300 mm deep capitals functioning as a transfer structure to carry the loads from the walls and columns above onto the grid of the garage columns below. The ground floor slab is cast with concrete, specified to have a strength of 35 megapascals at twenty-eight days. The three floor levels above the ground floor, are designed as 210 mm thick reinforced concrete, flat plates, supported on rectangular columns and shear walls, which also act as part of the fire compartmentalization. The upper floors and low roof slabs are cast with concrete with a specified twenty-eight days strength of 30 megapascals. The roofs of the five elevator penthouses are one-way reinforced concrete slabs supported on the reinforced concrete elevator shaft walls, and reinforced concrete perimeter beams, supported on reinforced concrete columns, carried on the 280 mm to 365 mm thick reinforced concrete flat plate, of the low roof, with slopes to the roof drains. The high roofs of the four mechanical penthouses are constructed of structural steel beams, supported on structural steel columns, bearing on the 385 mm thick portions of the low roof. The steel beams carry 38 mm deep, by 0.91 mm thick, steel roof deck. Inclined structural steel rafters are used, at the perimeters of the mechanical penthouses, to support the same type of steel decking, and to achieve the Mansard style roofs which are clad with slate shingles. In addition to the one level of subgrade parking, there are amenities facilities in the lower level, below grade, which includes a large Roman style swimming pool with a two sided semi-circular grand stairway leading out to a beautifully landscaped garden. The building is clad with precast concrete cladding replicating classical stone work.